While we’ve been in Finland these past two weeks, we’ve been learning about the “renewal” of the Finnish Core Curriculum. In a recent post for Diane Ravitch, Pasi Sahlberg gave a Finnish perspective on some of the similarities and differences between this core curriculum and that of the Common Core in the US. As U.S. educators who have been studying teacher education and school improvement efforts in a number of countries including Finland, we are finding several other aspects of the renewal process particularly interesting. As others have noted, the Finnish core curriculum for basic education (grades 1-9) is better understood as a kind of ‘framework’ that guides curriculum and instruction—rather than a strict and specific scope and sequence of topics and skills that must be taught. Less well known perhaps is the fact that the demands of the core curriculum go far beyond specifying the objectives in school subjects. In fact, the core curriculum requires (among other things) that the curriculum developed by municipalities and schools reflects the underlying values of Finnish basic education (“human rights, equality, democracy, natural diversity, preservation of environmental viability, and the endorsement of multiculturalism”); describes the main features of a school’s “working culture”; specifies criteria for grading and for final exams in ninth grade (the end of Finnish basic education); establishes objectives for pupil behavior; dictates that parents’ and guardians should be able to have an influence on local education objectives; and requires the drafting of the local curriculum in collaboration with those involved in municipal social and health services. While we were initially told that the core curriculum is revised or “renewed” every 10 years, we’ve found that there is no hard and fast rule about this (in contrast to Singapore, for example, where the curriculum for each subject is revisited on a regular schedule). However, periodic debates about education have initiated revisions in the curriculum in 1985, 1994, in 2004, and today. Each time the process and outcomes have been somewhat different, calibrated it seems to provide tighter control at some points and more flexibility in others (see Karl Weick and others on tight and loose coupling). In the 1970’s for example, the entire nation was engaged in the development of the Finnish basic education system and a Finnish national curriculum specifying what was to be taught in each subject and at each level was created. 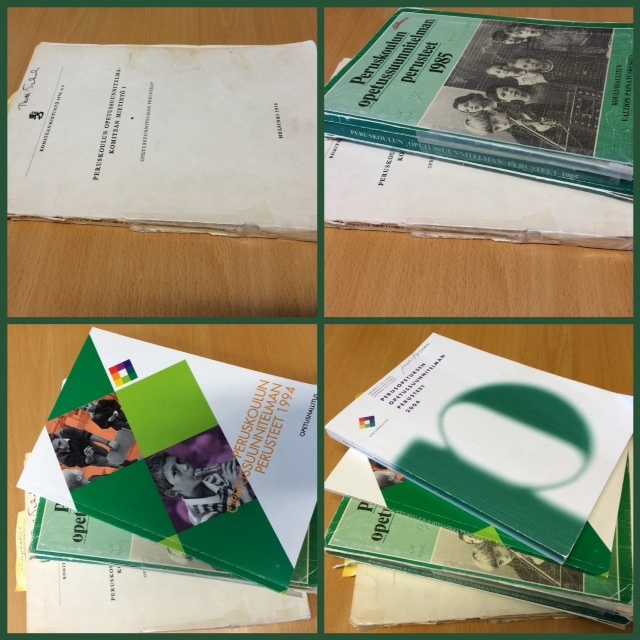 (In fact, the accompanying picture of the original curriculum of the 1970’s only includes the first section, a thicker volume includes the curriculum for each subject). Almost immediately, however, discussions about the need for local flexibility began, and the first revision in 1985 created the first “core curriculum.” The core curriculum was somewhat thinner, providing guidelines, objectives, and content for school subjects, and granting municipalities primary responsibility for developing their own curricula. In the 1990’s, in an era of decentralization, the core curriculum became even thinner as guidelines were reduced further and power to draw up local curricula in many municipalities was delegated to schools. But by the early 2000’s (notably just before the first PISA results were released), there were concerns in Finland about a lack of consistency across schools and about a lack of support and specificity from some municipalities (particularly smaller municipalities that had very limited staff to work on the curriculum). Those concerns contributed to an expansion of the national guidelines in 2004 that specified some of the criteria that teachers and schools had to use to assess students’ performance. In the current renewal, some the initial discussions of changes have focused on the kind of teaching teachers can do to promote learning and on broadening the conception of good teaching beyond ‘traditional’ desk learning to include a variety of active, constructivist and research-based strategies; but whether the core curriculum will be thinner or thicker, “tighter” or “looser,” remains to be seen. Although the process for developing the core curriculum has evolved over time, particularly in the last two renewal cycles there has been extensive involvement of key education stakeholders from the very beginning of the discussions. Thus, numerous “curriculum groups” have been at work developing the guidelines and objectives in each subject and aspect of the core curriculum. Teachers are at the center of these committees, though the committees also include school leaders, municipal administrators, teacher educators, and researchers among others (and many of those other representatives have themselves been teachers at some point in time). In addition, an advisory board overseeing the whole process includes a cross-section of representatives of teachers, school leaders, parents, students, textbook publishers, researchers, teacher educators, ethnic groups (for instance representatives of the Sami people), and municipalities. In past revision cycles, there were opportunities available to give feedback to the draft curriculum before it was formally adopted. However, this particular revision has been the most “open” of all. Surveys have been sent to all the municipalities so that they can share their responses to initial drafts; municipalities and schools have been encouraged to share and discuss the initial proposals with parents and students; and initial drafts of the curriculum have been made available online so that anyone who wants to can provide feedback. That feedback has already come from numerous individuals as from more than 200 different organizations representing many aspects of Finnish society. Members of the committees are looking at that feedback as they make revisions. The feedback addresses the broad objectives as well as the specific language used. (For example, the use of the word “tolerance” in an early draft’s discussion of diversity and culture was changed because of feedback that it conveyed a limited sense of acceptance, rather than mutual respect and understanding.) Interestingly, those we talked to who have been involved in the process also report that there are widespread concerns about financing and the ability of schools and municipalities to adopt the new guidelines. In turn, these concerns are contributing to calls from some in the field for more detailed guidance from the national authorities. In the end, the curriculum groups will make the proposals for the new guidelines and the leaders of the National Board of Education will make the final decision. Of course, such an open process can be unwieldy, but the wide engagement of teachers, leaders, teacher educators, textbook publishers, researchers, parents, students and others in the process creates social connections that facilitate the sharing of information and knowledge about the changes long before those changes are actually made. In fact, the working committees and feedback process has been going on since about 2012, well before the new core curriculum is scheduled to be adopted this year and long before the required development of new local curriculum in 2016. That means that those who are involved in supporting the work of teachers and students—like teacher educators and textbook publishers—are already getting a sense of where the revisions are heading and what kinds of changes they will need to make so that the whole system is “ready” at the introduction of the new local curriculum. More than a mere adjustment to ensure the system is “aligned”, however, the curriculum renewal process can also be seen as an extension of the crucial, collective, nation-building effort that Finland launched in the 1970’s to create the basic education system. Curriculum renewal in Finland provides an opportunity for those all across the country to re-commit themselves to a national enterprise and to develop the shared responsibility for carrying it out. This entry was posted in About K-12 International Education News and tagged curriculum, Finland. Bookmark the permalink.